Caption: Crustaceans, Brachyura Crabs, True Crabs, Spider Crabs, Decorator Spider Crab, Retusa Spider Crab, Seaweed Decorator Crab, Rubbish Crab and Velcro Crab. 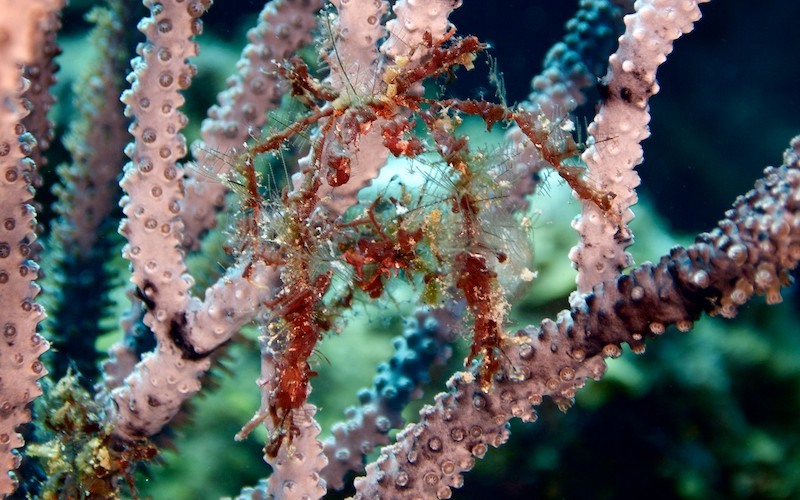 Found on coral and rocky reefs often walking along the sand covered in shells, seaweed, rubbish etc. This is attached by hooks to its shell to act as camouflage against predators. Hard to spot because of this. They feed nocturnally on invertebrates. Length 3cm Depth - 10-15m Widespread Indo-Pacific Brachyura crabs are considered true crabs, they have a short abdomen, 4 walking legs and a pair of clawed arms at the front. Many thousands of species live worldwide in sea water, fresh water and on land.